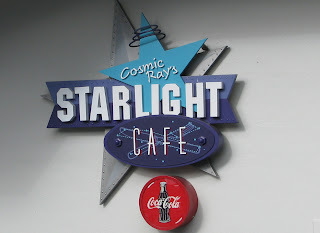 Cosmic Ray's Starlight Cafe is a quick service restaurant located in the Magic Kingdom. It is located between Fantasyland and Tomorrowland, right across from the Tomorrowland Speedway. The restaurant is set up with 3 different bays: Bay 1 - Chicken, Bay 2 - Burgers, Bay 3 - Sandwiches. For each of these bays, guests stand in a separate line. An advantage of this setup is that the lines can be shorter because they are spread among 3 different locations. However, if you want an item from Bay 1 and your child wants an item from Bay 3, you must stand in two separate lines. Thus, the bays can make gather the foods time consuming. Once you have your food, you have a special treat or two in store for you! While the food you will eat is pretty good (being sometimes optimistic with that statement), the location and the entertainment are great for children. When eating inside, a large room includes the music of the "out of this world" alien, Sonny Eclipse. Sonny provides music is soothing, entertainment for my son and the restaurant space is highly air conditioned. For these reasons, it often becomes my sought after lunch spot! Remember Cosmic Ray's for an inexpensive dining experience for fun entertainment and great Cinderella Castle viewing! Also, be sure to catch Kristen and I weekly on Castaway Midday! Natalie H. is creator of Meet the Magic and guest contributor to Cooking with Mickey. She'll be providing Disney Magic and Kids - all about dining at DIsney with kids and giving great tips to make the most of your family dining experiences. Make sure to follow her on Twitter @nrhenley and @meetthemagic.